There are 12 reviews of M.
M is one of a kind. 100% you can bet on it, you'll never smell anything like this. It's very unique and well composed for something I picked up for $15 for 100ml. It is salty, breezy and fresh but sticky and gooey from the marshmallow. The gardenia is true to scent and the tiare adds to the salty, fresh beach scent of the beginning. Incense and amber follow. I get no patchouli. The incense gives the whole smoky veil to the perfume, whilst the amber makes it feel like a warm sandy hug. M reminds me of a bonfire on the beach roasting marshmallows. I love it to bits. This is one of my favorite celebrity fragrances, it smells very...creative. It seems to smell vastly different on different people. On me, when I first spray, it smells like marshmallow, tiare, a little sea breeze, a little gardenia, and amber and patchouli. When it starts drying down, it smells like marshmallow and all three base notes. When it completely dries down, it smells more like patchouli than anything (the spicy, hippie kind, not sweet patchouli!) with moroccan incense and a hint of marshmallow every once in a while. You can easily pick apart the notes in this, the scents don't really blend to smell like a perfume. Rather, they smell like you eat a lot of marshmallows and light moroccan incense in your spare time, and maybe you wear patchouli. It lasts for a VERY long time. I don't have to put on more throughout the day, and I do like my patchouli strong so that's saying something. The packaging is terribly cheap, I just decant it into something else. It's worth trying if you like strong and unique, just keep in mind it might not smell as deep on you as it does on others! This fragrance is a little different from your typical celebrity scents. When you first smell this, you can sense the creativity and thought that had gone into this perfume's composition. Combining the saltiness of the ocean and the sugary sweetness of the marshmallow, M creates a scent that is both mature and fresh. The fragrance is in no way cloying, it is actually rather intimate as it stays close to the skin. After a few hours this fragrance warms into a soft vanilla and incense, which is incredibly soothing and calm. Because of this perfume's aquatic notes, I think this would make a great beach or Summery scent. The lasting power is excellent and the fragrance is very feminine and sensual. 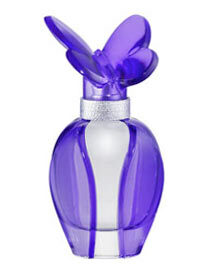 The bottle design is also quite beautiful, and the butterfly lid adds a sense of playfulness and vitality. The top notes say it all. The is synthetic, sweet and FRESH. I like a creamy marshmallow note as much as the next person, but the components in this one were a bit too strident. For some reason, I could taste this in my month after I applied this to my skin (which occasionally happens to me~maybe an allergic response). After about 15 minutes, the volume fades but it is the same aggressively girly, juvenile, fresh mess. I like it ! M is a soft woody floriental on me that will be very wearable in home/work/shopping scenerios too strong for church though.I'll be getting a bottle this week. There are no member images of M yet. Why not be the first?